Greg Monroe was a steady guard for Syracuse capable of playing both the point and shooting guard positions. Monroe was distinctive on the court with his barrel chest and his high release point on his jump shot. 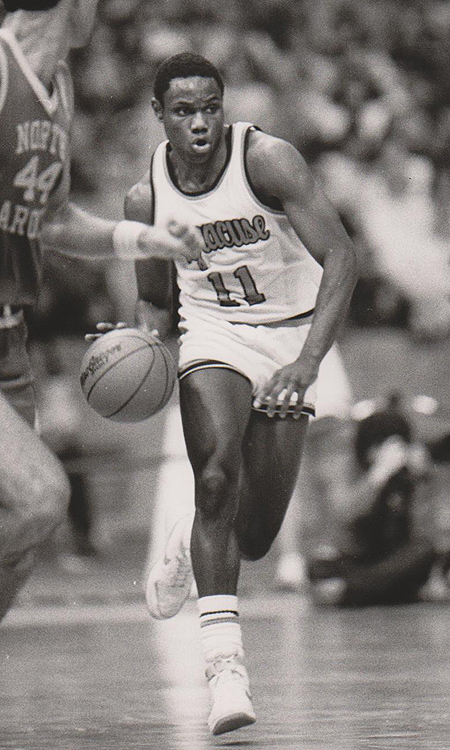 Monroe came to Syracuse at the same time as Pearl Washington. Where as the Pearl was flashy and spectacular, Monroe was very workmanlike in his approach to the game. His first three years he would be a valuable sixth man, giving Pearl a rest when needed, filling in at the shooting guard, and playing when Jim Boeheim spread to a three guard offense. Monroe was named a co-captain of the Orangemen his senior season, along with Howard Triche. That season was the first with the three point shot, and Monroe quickly mastered it. He would consistently stay outside the three point arc, and when Sherman Douglas would drive into the lane, or when Rony Seikaly or Derrick Coleman got a rebound, they could kick it back out to Monroe who would be waiting for an open three point shot. Monroe developed into a clutch shooter; he would be third in the team in scoring, and would average four assists a game as the shooting guard. His steady play, team leadership and shooting were critical components in guiding the Orangemen to the National Championship game in 1987. Monroe was named to the Big East Conference 3rd Team his senior year. He would play in the CBA following his career at Syracuse. From 1987 to 1988 he played for the Quad City Thunder.